Antibody selection is one of the most critical steps in getting high-quality flow cytometry results. High background signal from antibodies often compromises it. Antibodies not optimized for flow cytometry can detect signals that are not specific to the antigen resulting in high background signals. One of the reasons for high background signals is non-specific binding of antibodies to Fcγ receptors (FcRs) found on macrophages, monocytes, dendritic cells and B cells. To avoid this type of non-specific binding, FcR blocking reagents are used during antibody staining. However, the Fcγ receptor blocking procedure end up being time-consuming and costly. Miltenyi Biotec’s new generation of recombinant antibodies for flow cytometry, REAfinity Antibodies, eliminate the need for extra Fcγ receptor blocking steps. REAfinity Antibodies have mutated human IgG1 Fc regions which eliminate non-specific binding to Fcγ receptors. 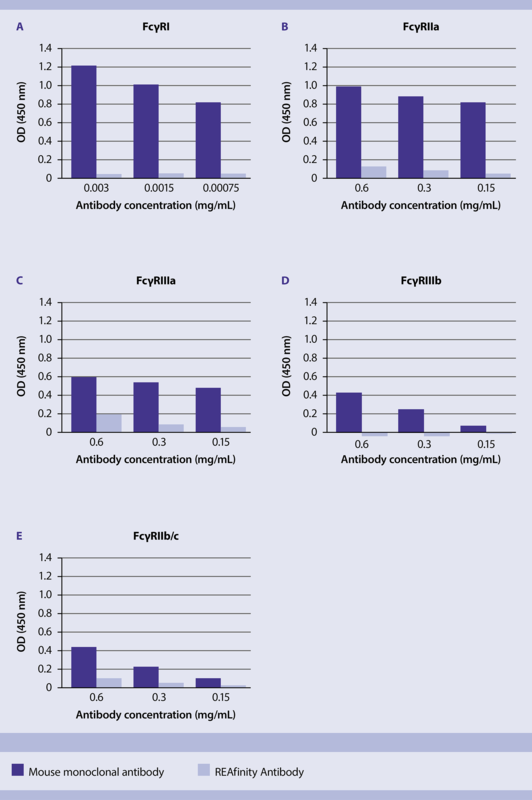 Comparative analysis of a REAfinity Antibody with a mouse monoclonal antibody demonstrates the superiority of REAfinity Antibodies with respect to specificity and background signal. Figure 1: Binding of a mouse monoclonal antibody and a REAfinity™ Antibody to Fcγ receptors. Figure 2: Staining of cells with a mouse monoclonal antibody or a REAfinity™ Antibody in the absence or presence of FcR blocking reagent. 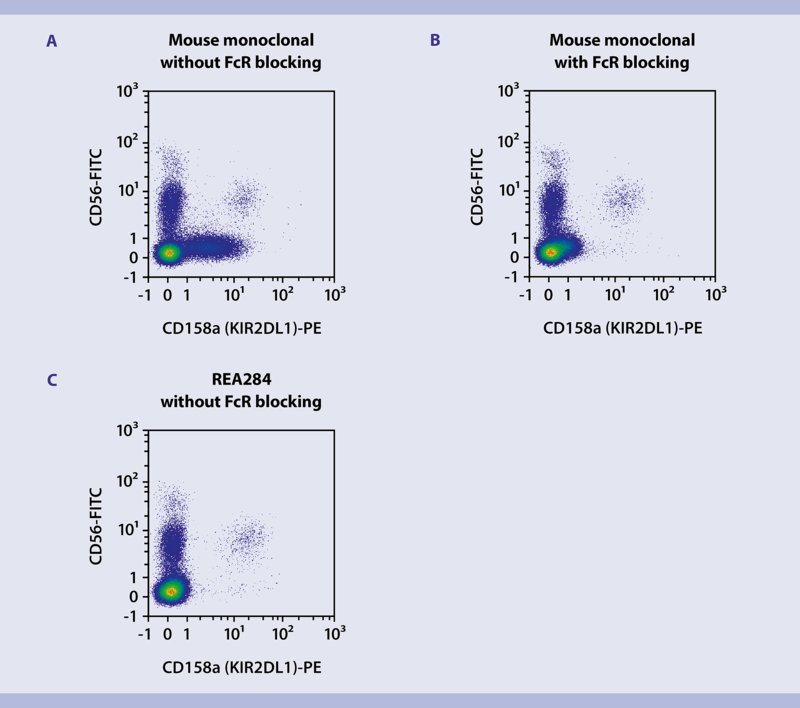 Flow cytometry analysis reveals low background signals with REAfinity Antibodies. Without an FcR blocking reagent, staining with the mouse monoclonal antibody results in strong non-specific background signals (figure 2A). With an FcR blocking step prior to staining with the mouse monoclonal antibody reduces background signal (figure 2B). Staining with the REAfinity Antibody allows specific detection of the target population, even without FcR blocking reagent (figure 2C). Hence, staining with REAfinity Antibodies eliminates unwanted Fcγ receptor binding resulting in higher stain indices, greater reproducibility and time and cost savings. REAfinity Antibodies are an improvement in many other ways compared to conventional antibodies for flow cytometry analysis. REAfinity Antibodies are highly specific, recombinant antibodies specifically optimized for flow cytometry. They provide superior lot-to-lot consistency as they contain only one heavy and one light-chain compared to mouse monoclonal antibodies which often contain mixtures of different IgG heavy and light-antibody chains. A highly-controlled manufacturing process ensures high purity for reproducible, publication-quality results. Besides, REAfinity Antibodies all have human IgG1 as their isotype. A universal isotype control means more cost and time savings. Still struggling with messy background signals in your flow cytometry data? Learn more about REAfinity Antibodies and see how you can reduce background signal and improve reproducibility in your flow cytometry experiments.